Citizens have an opportunity to provide feedback on a proposed 45-unit apartment complex in the Trinidad Neighborhood. Local developer Ditto Residential LLC is proposing a 4-story 45-unit apartment complex to replace the existing 1-story commercial building at 1326 Florida Ave NE. The property is located next door to Engine 10, the local firehouse on Florida Avenue. Current zoning regulations require a 45-unit development to have a minimum of 23 parking spaces for use by apartment residents to reduce impact on neighborhood parking capacity. However, the developer has requested permission to build only 16 spaces for the 45 apartments, requiring review by the Board of Zoning Adjustment (BZA) including a public BZA hearing. As a part of the zoning variance process, citizens may submit comments to the BZA supporting or opposing the requested parking variance. In addition, local ANC commissioner Tina Laskaris plans to hold a community meeting to discuss the project. Submit written comments to the Board of Zoning Adjustment at bzasubmissions@dc.gov referencing case number 18785, or testify at the BZA hearing on June 24 at 9:30 am at 441 4th Street NW in room 220 South. For more information, contact the Office of Zoning at 202-727-6311. Attend ANC Laskaris’ local meeting to discuss the project on June 4th at 7pm at the Joe Cole Recreation Center, 1299 Neal Street NE. For more information, contact ANC Laskaris at 5D06@anc.dc.gov or 202-549-0153. Attend the full ANC 5D meeting to express comments on June 10 at 7pm at the local MPD station at 1805 Bladensburg Road NE. 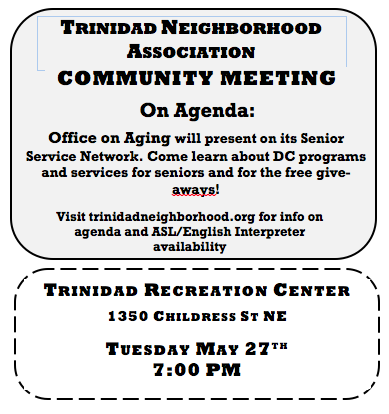 For more information, contact ANC 5D Chair Henderson at 5D05@anc.dc.gov.